In her blog of 12 October 2015, Sharon Kirkpatrick, one of our secondees, talked about her work to develop a package of material for local authority chief executives and library portfolio holders. introduces ideas on smarter ways of working. The Toolkit also includes many case studies, sharing good practice from across the country. None of this would have been possible without the hard work of Sharon (who led the project and wrote much of the content), Charlotte Lane and Julia Chandler (who turned it into the web document you can see today), DCMS and Sue Charteris (for the accompanying guidance describing the statutory nature of library services), all the Taskforce members (for inputting to and commenting on the draft document), and to everyone who contributed to the case study collection. I thank you all for your time, for sharing your knowledge so generously, and for your patience. I described this Toolkit as a 'beta' version - a very helpful concept that we used frequently in my days in the Government Digital Service. It describes a product that is still in development - a few people have reviewed it and provided feedback, but now we want to open it up to a wider group of users to gather their views. 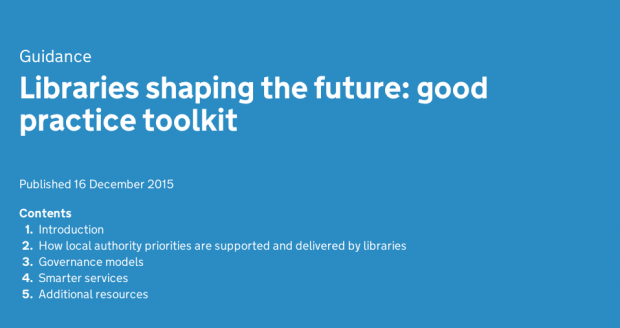 We will do a formal 'live' launch of the Toolkit in the new year so expect to see more communications then.